Ampthill winger Daryl Dyer has revealed the Amps players are feeling confident and looking for a top-five finish in their first season in National One. 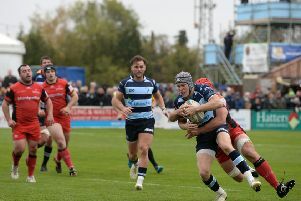 The powerful winger was speaking after Saturday’s tri-angular tournament between the A’s, Bedford Blues and Old Albanians at Goldington Road. Ampthill ended up drawing 5-5 with Bedford before losing 10-5 to Old Albanians, but Dyer believes the team are more than capable of finishing in the top five in their first ever season in the third tier of English club rugby. “Yeah it’s going to be a big step up from National two,” claimed the former Bedford man. “The recruitment is going well and the boys are looking sharp in pre-season, it’s good to get started. “We are looking to give it our best this year and within the team we are aiming for a top five finish. Ampthill’s 19-10 win over Bishop Stortford on the May 2 secured promotion for Paul Turner’s side, and it will see them compete in a national league for the first time. Long trips to Plymouth and Blaydon in Newcastle, amongst others, await the club for the first time but Dyer isn’t too concerned about that just yet as pre-season is still going well for the club. “It was great to get out and play some rugby today (Saturday) for the first time, we’ve been doing rugby specific training, conditioning games and skills and today was all about taking that into the game and working hard, which I thought we did. Ampthill have two more pre-season fixture remaining, they travel to the north of France this Saturday to play Stade Rouennais before finalising their pre-season programme by welcoming Welsh side Pontypool to Dillingham Park on Saturday, August 29. They begin their National One adventure on the September 5 with an away trip to Esher.